Material: carbon steel body materials are divided into. Coating: ABS light yellow coating, Nano ABS, thickness of 250~300 Microns. Eyewash: carbon steel inlet pipe, stay –open ball valve switch and eye wash bow. Parts: shower, eyewash basin, eyewash elbow, Spray head. Shower head, pull rod, and spray head, eye wash bowl, outlet pipe, installation bracket, eye wash valve, and sign. 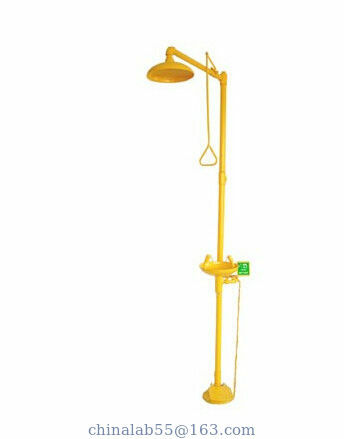 Emergency shower eyewash is according to the U.S. ANSI Z358.1-2004 stand. 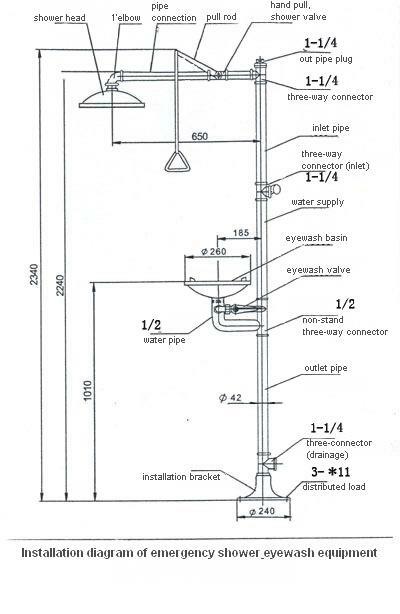 Each component of the length, height, water flow, water flow and spray area in the designated set code. For emergency equipment, Eye wash is ergonomically designed with two spray heads, and height and the angle of the heads offer face most comfort. The specially designed spray holes soften water spray and protect eyes effectively. Emergency eyewash series are widely used in pharmaceutical, chemical, petrochemical, electronics, semiconductor companies in hazardous work areas and laboratory emergency safety device. Single object or toxic chemical liquid splashing into the staff body, face, eyes, or Fires caused by staff clothing fire, the device can quickly minimize the risks and reduce the toxic and hazardous substance qualitative physical injury to staff. 1. Shower head delivers 75.7 liters/minute, as the standard hydraulic pressure. 2. Hands- free stay-open valve activates in one second. 4. Water pattern is 500 mm in diameter at 1520mm above floor. 5. Spray head delivers 1.5 liters/minute as the standard hydraulic pressure. 6. Distance between two spray heads is 180mm. 7. Hands-free stay-open valve activates in one second. 8. Height from spray head to the bracket is 1050mm. 9. Easy to operate. high strength; solid structure. 10. Good resistance to oil, anti-acid, anti-alkali, salt solution and other properties.